After the investigation is completed, the BON makes a decision whether to close the case, move to a settlement conference, suggest an alternative program or proceed to filing formal charges and presenting evidence at a hearing. An important part of the disciplinary process is providing the subject nurse an opportunity to respond to the allegations and present her/his side of the case. Settlement conferences are most often used in cases where substantial evidence exists to prove one or more violations of the nurse practice act. In these cases, the BON and nurse agree to the terms and type of disciplinary action. Administrative hearings provide another means for complaint resolution. Prosecuting attorneys present a case to the board, panel or administrative law judge with the nurse or nurse’s attorney presenting a defense to the charges. After hearing both sides, the judge or panel will make a determination which will often include a proposal for decision, as well as findings of fact and conclusions of law. 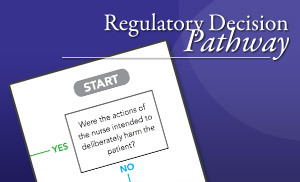 Alternative-to-discipline (ATD) programs are voluntary, non-public and non-disciplinary programs for specific violations of the nurse practice act. Most jurisdictions offer non-disciplinary ATDs for Substance Use Disorder. A few jurisdictions offer other types of ATDs. Practice related ATDs or remediation programs target early identification of nurses demonstrating opportunities for improvement in the areas of clinical knowledge, skills or abilities. Assists boards of nursing in evaluating practice error or unprofessional conduct cases.